In this article we’ll run through what each of the metaboxes in the team member admin pages are for. These are mostly read-only views for admin purposes. Team Details – This section holds contact and personal information about the team member, see Adding a Team Member for more information. 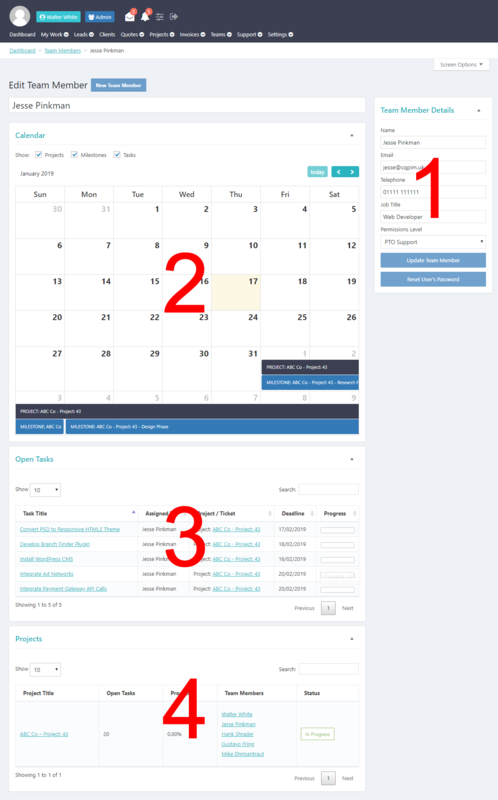 Calendar – This section shows all projects that the team member is assigned to. Within this it shows the milestones and tasks within those projects, linked to the relevant items. Open Tasks – This section shows all open tasks related to the team member, their deadline and their status. Projects – All projects that the team member is assigned to and the status of the project.